Dyus is an Imperial who helps you assume the Throne of Madness. Long ago, he was the Keeper of the Library of Jyggalag and Jyggalag's chamberlain, and is now imprisoned in Knifepoint Hollow. Sheogorath gave him immortality so the secrets of Jyggalag would be kept forever. He cannot be interacted with before the quest, as he is sealed behind a stone wall that can only be opened with a key that Haskill gives you during the related quest. He will forever sit on his throne, never leaving his prison. His dialogue changes once you complete the main quest of the Shivering Isles, but despite your newly granted powers there is no option to release him from his imprisonment or his enforced immortality. However, he will follow you out of the cave if you fight him. His only possession is his clothing, a grey robe. When you initially discover Dyus locked away he will beckon that you come closer; "Step forward, herald of madness. Speak with me if you would." If you comply with his request he will explain his purpose, and your purpose for meeting him: "I have been waiting for you, Your Grace. This day, as all days before and after, is well known to me. There are no surprises to Dyus of Mytheria. Sheogorath has fallen and you seek the means to foil the machinations of the Prince of Order. You seek the Throne of Madness. However, no mortal may sit upon the throne without the staff. So here you are in my prison, seeking to supplant the one who placed me here. If you wish to take the place of Sheogorath, then ask me what you will." Asking him about himself will have him reply; "You were expecting a book. An ancient tome filled with the secrets that you seek. But instead, you have found me. The last remnant. Individuality is an illusion. The details of my existence are no more important than the history of a stone. However, if you insist: I once served as the keeper of the great library of Jyggalag." Asking him about the great library of Jyggalag will have him explain this institution: "The great library was the height of logic and deduction. Contained within its walls were the logical prediction of every action ever taken by any creature, mortal or Daedric. Every birth. Every death. The rise of Tiber Septim. The Numidium. Everything. All predicted with the formulae found within Jyggalag's library. When Sheogorath discovered the library he had it burned, insisting that it was an abomination and that personal choice defied logical prediction. I am all that remains of the knowledge contained within the great library of Jyggalag." Asking him how he has survived will have him explain his immortality: "Following each cycle of the Greymarch, Sheogorath has cast out or killed every aspect of Order found in the Shivering Isles. I alone have survived. Sheogorath cannot bring himself to destroy the knowledge that I possess. Instead, he has confined me to this place and forbidden me to die. I have not seen another creature until fate, predictably, sent you to me." Telling him that you are done questioning him about himself will have him comply to your command: "As you wish." Asking him about his prison, Knifepoint Hollow, will have him explain this locations original purpose: "Knifepoint Hollow is my prison. As the Great Library, it once contained all the knowledge in creation. However, spare me your grief. My imprisonment is as meaningless as my immortality. Time and place are nothing. Constructs of a feeble mortal mind attempting to categorize and understand the world around it. If you were one of the fortunate few, you would one day understand and accept this. However, you are not and you will not." Asking him about the Staff of Sheogorath will have him explain what needs to be done to make a new one: "I can create the physical shell of the Staff, but the divine essence must be gathered elsewhere. But, apotheosis is no simple matter and the creation of the staff is no simple task. I will require two sacred items in order to complete it." 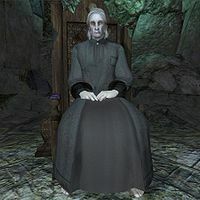 Asking about the first item you must recover will have him tell you what you need; "The Shivering Isles hold many secrets but few remain unseen by mortal eyes. The Staff is a tool of great vision and thus, requires the eye of one who has witnessed one of these unseen secrets firsthand. Ciirta resides in the Howling Halls of Mania. Find her and bring me the eye that has seen that which no other has." Questioning him about the second item will have him tell you the other piece of the staff you will need; "The trees and branches of this Realm feed from a deep font of madness and mystery. One of the oldest trees, named the Tree of Shades, lies in the halls of Milchar. Milchar is a place of ruin, root, and mania. Go there and bring me a branch of this tree, but be warned -- the tree will not surrender its secrets to one who has not earned them." Asking him what you will accomplish by completing these tasks will have him respond by saying; "Yes. Only then can I create an appropriate vessel to hold the power that is inherent in the lord of this realm. The Staff may allow you to occupy the Throne of Madness, but understand that such a feat has never been attempted. All sources indicate that you will fail. It is a certainty. However, I also predict that this will not stop you from trying." Asking him for more information on the first component you need, the eye, will have him further explain its purpose: "The Staff of Sheogorath holds the secrets of this Realm. As such, it requires a vessel that has witnessed dark secrets. Ciirta has seen things with her eyes that no mortal has. Because of this, her eye will serve well to contain that which the staff must hold." This monologue will change slightly once you get the eye, an extra line acknowledging your capture of the eye, and another line reminding you to also get the branch, will be added to the end of this text: "Now that you have her eye, you must seek out a branch of the Tree of Shades." This line at the end of the original speech will be changed once you obtain the branch: "Now that you have both components, I can remake the shell of the staff." Asking him about the Tree of Shades will have him reply by saying; "The roots of the Tree of Shades run into the heart of the Shivering Isles. It is said that the tree feeds from waters of the Grove of Reflection. The grove can show men who they truly are. Only after facing the truth will the Tree of Shades give up its branches to you." This monologue will change slightly once you get the branch, an extra line will be added to the end of it: "Now that you have faced the truth, the Tree has given its branches to you." this topic will be altered once you also obtain the eye, by adding another line to this monologue: "Combined with the Eye of Ciirta, the shell of the Staff can be remade." Once you successfully gathered the needed components he will greet you by saying: "You have the items. Contrary to all prediction. Once again, you defy the path set before you. However, what comes next is now unclear. If you wish to confront what is to come, I shall create the Staff for you." Asking him about the Staff of Sheogorath now that you have the necessary components to make it will have him create the physical shell of the staff for you: "You possess the eye and the branch. Together, they shall form the physical shape of the Staff of Sheogorath. After I shape them into the Staff, you must take it to the seat of power in the Shivering Isles -- the Palace of Sheogorath. There, imbue the Staff with power from the Font of Madness. Soak the staff in the waters of the land, and it will open its full power to you. You have defied the expected and accomplished something that denies all logic. I must contemplate the error in my calculations. Now... take your treasure and leave me." Speaking to him again will have him rebuke your wish to converse, reminding you of your task: "I have said all that there is to say. If you wish to continue, you must proceed to the palace." Speaking to him after you successfully finish remaking the staff, making you the new Sheogorath will have him acknowledge the fact that you beat the odds, proving him wrong: "Hrmph... it seems that I made a miscalculation. Against all odds and all the knowledge that I possess, a new Sheogorath is risen. How I loathe the idea of personal choice. It makes things so... imprecise. However, you shall still fall victim to the same pitfalls as he. Leave me to my torment, Madgod. Leave me to suffer as Sheogorath before you." After this whenever you speak to him he will occasionally call you by your new title, though he will show you no extra respect for it, and will wish that you just leave him alone: "Yes, Lord Sheogorath? Why do you disturb me?" "Lord Sheogorath... as I expected. I will hear you and then ask for peace from your prattle." "Say what you will, receive your answers, and leave me to my solitude." Asking him about his torment as Sheogorath's prisoner will have him explain that he was spared because Sheogorath couldn't bring himself to destroy him: "Your predecessor cursed me with immortality and placed me in this remote location in order to "protect His Realm from my knowledge." In truth, I was Jyggalag's trusted chamberlain and the keeper of the great library. He could not bring himself to destroy the knowledge that I represent, which is to say, precise predictions of all that is, has been, and will be. And so, here I remain until the day that Sheogorath -- or rather, you -- choose to release me. And we both know when that will be..."
Esta página foi modificada pela última vez à(s) 13h58min de 30 de novembro de 2013.